Of all the groups that contributed to Merseyside's music scene at the beginning of the '60s - and there really were thousands of them - there can be no denying that the Big Three stood out, both in terms of their sense of innovation and the strong personality of the individual members. The band was immediately distinguishable from the rest of the bunch because, as the name suggests, there were only three members. 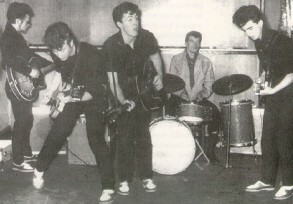 Not that this ever constituted a problem in terms of sheer impact or musical ability; indeed, along with the Beatles, the Big Three featured regularly at the top of the hit parades of "Mersey Beat", the newspaper that acted as the guiding light for the entire Merseyside entertainment scene. Likewise, the sheer energy that they unleashed during live performances was quite unique and had a devastating effect on their fans. Furthermore, the Big Three were not without that necessary dose of craziness that was also an important weapon for some of the members of rival groups. The eccentric behaviour of guitarist Adrian Barber was every bit as legendary as that of John Lennon of the Beatles. It was almost as though they were competing to see who could come up with the strangest exploit. 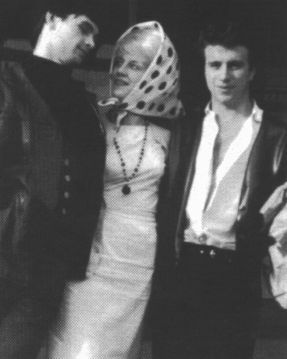 If John strolled about naked on stage with a toilet seat strapped around his neck, Adrian would walk down the street dragging a hairbrush on a lead! Yet the early part of the group's history is not particularly worthy of note. 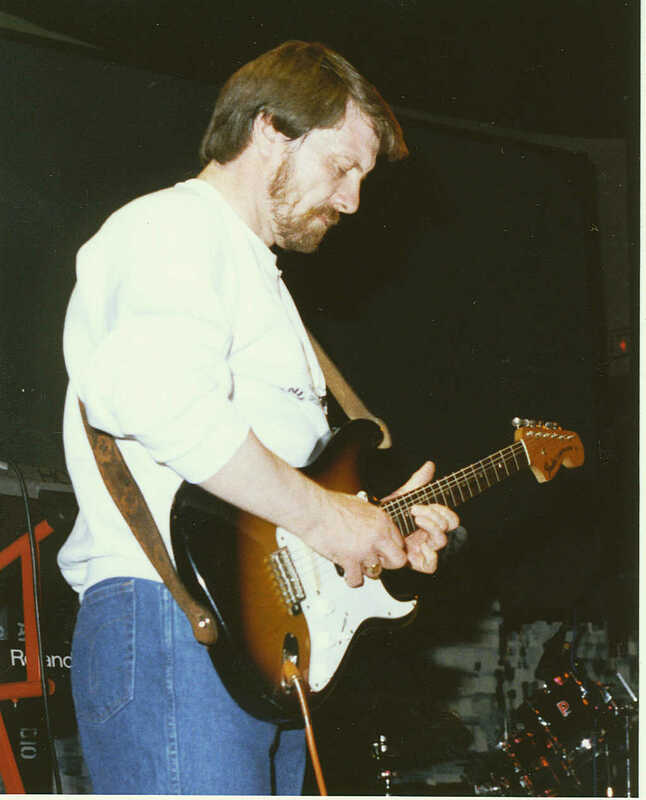 It was guitarist Brian Casser who first had the idea of forming a band in 1959. Using the name Cass & the Casanovas, they began to play at various clubs and pubs in Liverpool, serving up anything from Latin American music to traditional rock & roll. In addition to Casser, the other members were bassist Johnny Gustafson, drummer Johnny Hutchinson, and guitarist Adrian Barber. In 1961, the Big Three underwent their first real change in line-up, with the departure of Casser. The remaining members stayed together as a trio, placing the emphasis on their aggressive stage act and scorching rock & roll/R&B repertoire. 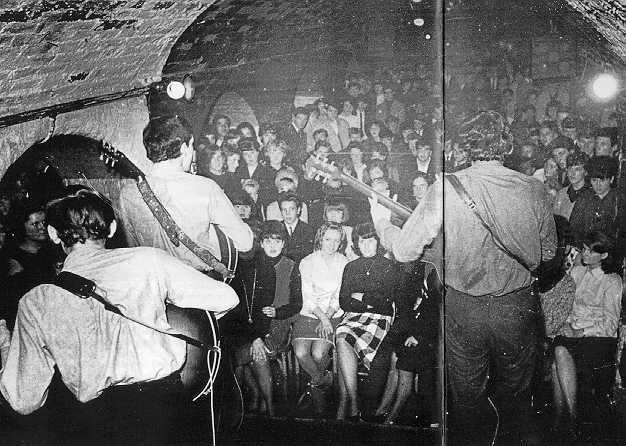 The legendary Cavern Club soon became the band's favourite battleground; they even took the club's cloakroom attendant, Priscilla White (better known as Cilla Black), under their protective wing for her first live performance. Like many of their contemporaries, the Big Three soon embarked on the first of several brief trips to Hamburg. This strategy continued until Adrian Barber decided not to return to Liverpool, preferring to remain in Hamburg as manager of the Star Club. And so it was that, in July 1962, Brian Griffiths joined the Big Three as replacement for Adrian. Griffiths was fresh from a term in one of the most glorious and legendary Merseybeat combos, Derry & The Seniors, who debuted in 1959 and went on to become Howie Casey & The Seniors. Blessed with great charisma, they have a place in history as the first group from Liverpool to make a record (released on the Fontana label). They broke up in June 1962. Griffiths, a guitarist of enormous talent, therefore joined the Big Three having already picked up useful experience in Hamburg with musicians of the calibre of bassists Frank Bowen and Lu Walters, saxophonist Howie Casey and drummer Frank Wibberly. This event also signalled the beginning of the period of greatest notoriety for the Big Three. Adored by their fans, who followed the band everywhere in ever-increasing numbers, they took the Liverpool scene by storm, generating a hurricane of musical energy at every gig. Tours, records, TV...and a lot of success. We had the good fortune to establish contact with Brian who, after plying his trade in several other bands with Johnny Gustafson, decided to "throw it all in" for a new life in Canada. We even had the opportunity to ask him a few questions about his musical recollections of that extremely pulsating era. 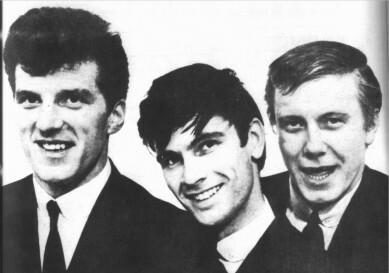 Are you able to look back with nostalgia at the Merseybeat era, or do you feel a sense of bitterness that you might have been more successful, especially given that many people at the time reckoned that the Big Three were technically the best band on Merseyside bar none? BRIAN: I was in the right place at the right time, but it wasn’t all fun and games. It’s nice to remember the good times and it was a privilege to play with Johnny Hutch and Johnny Gus, who in my opinion were the best rock bass player and drummer in Liverpool from that era. As for being more successful at that time? We had the opportunities but not the maturity to take advantage of what was happening to us. C’est la vie! How did you get on with the Beatles as individuals? Did you know them on a personal level before they went out to Hamburg? BRIAN: The Beatles were just guys from Liverpool like ourselves, who loved playing rock "n" roll. We shared ideas, traded guitar licks, drank beer together, and played lots of gigs with them. 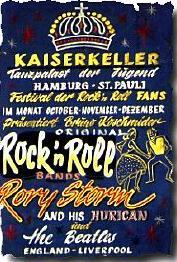 I started playing the same clubs as them in Hamburg (Kaiserkeller) when I was with Howie Casey and the Seniors in 1960. Even die-hard Beatles fanatics admit that the Fab Four had their fair share of lucky breaks which helped them to get ahead of the pack.When did you first sense that they were going to be world-famous? BRIAN: They always worked very hard at what they did, and they had the sound and talent as a group. I always thought it could have turned out differently if they hadn’t been managed by Brian Epstein. I remember we did a TV. show with them (Thank Your Lucky Stars)and there were hundreds of fans outside the studio going crazy for them. It was at that time Epstein had said "these guys are going to be bigger than Presley". With the absurdity of that statement I remember thinking this guy could be right and as they say the rest is history. A lot has been said about the Hamburg period: the wild audiences, the gruelling sets that the bands were expected to play, and so on.Was it really such a shock to the system for young lads coming from Liverpool? Photos of the Cavern Club would suggest that Liverpool venues were no place for the faint-hearted either! BRIAN: Hamburg is a seaport like Liverpool. Sure you played longer hours in the clubs in the St. Pauli district, but I didn’t see anything I hadn’t already seen in the rougher clubs and bars in Liverpool. Maybe someone from say Walton-on-the-Naze who visited Hamburg may have had a different opinion! I’ve always found it curious that British bands, and especially bands from Merseyside, were so well-received in Germany. After all, little more than a decade earlier, RAF bombers had razed numerous German cities to the ground. Do you recall being surprised at the time? Did you ever experience any trouble? BRIAN: Did you ever experience any trouble? In the war both Liverpool and Hamburg were bombed and I think we shared a lot of common respect for each other. Hamburg was a prosperous seaport and they were very proud of how the city had been rebuilt. Trouble? The only trouble was over girls! That can happen anywhere, even Walton-on-the-Naze. It’s a tragic shame that so little Big Three material was ever recorded. 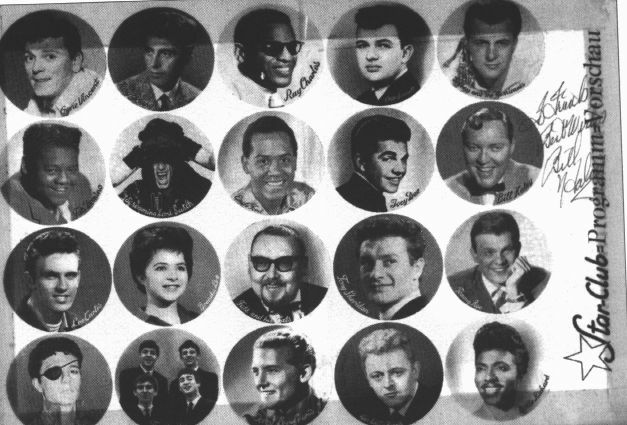 Johnny Gustafson has gone on record as saying that you all hated the more commercial songs that you were forced to do (such as "By The Way" and "I’m With You") and that you really wanted to be a tough R&B/rock & roll combo. Do you remember any of the other songs that you played live? 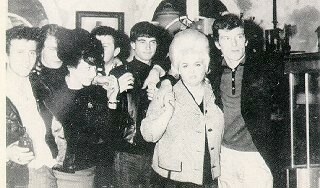 BRIAN: You have to remember we were signed by Decca, who had not long before turned down the Beatles. They couldn’t grasp the notion that many of the bands out of Liverpool didn’t want to sound like the British rock ‘n’ rollers of the 50’s. We were playing songs by American R & B singers unknown to most people in England. Being a Trio we played the music more aggressively and this was not accepted in the studio. It wasn’t long after, that bands like "The Who" were allowed to record like this. Some of the songs we liked to play live were Some Other Guy (toned down in the studio), Tricky Dicky, Ain’t That Just Like Me, Rockin Robin, Fortune Teller, Ya Ya, I know, What'd I Say, A Little Bit Of Soap, and Angel Baby. Initially at least, the Big Three rivalled the Beatles in popularity. How did audiences generally react to you? BRIAN: We respected each other as musicians and as a group, we could hold our own as far as playing and getting the audience into a frenzy. I personally didn’t get into comparing our band to the Beatles or anyone else. When we were on stage I was engrossed in the sound coming from Gus and Hutch and I just loved playing the music. There must have been an enormous amount of rivalry between groups on Merseyside. Stories abound of bands "stealing" songs from rival bands, and so on. Is that how you remember the Liverpool scene? BRIAN: No, not at all! Who cared if a band was playing one of your songs? We helped the Beatles with the words to "Some other Guy" which they later played the first time they appeared on Granada TV (I think it was "Scene at 6:30"). I remember that they had helped us to learn "Mr. Moonlight" at one time. There was a band called The Denisons and they would ask us if we minded them playing "our material" because they liked it so much. 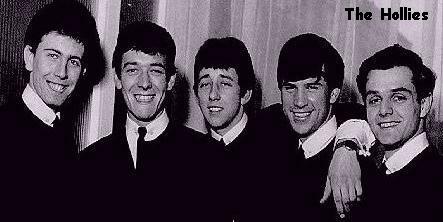 The Hollies liked our band and I think they heard us play "Ain’t that just like me" and later recorded it. Given the furious live activity both in Liverpool/UK and Hamburg/Germany, did you get much time to rehearse? 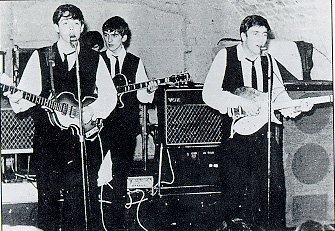 The Beatles were full of stories about frantically learning songs in the loo between sets! BRIAN: Very rarely did we rehearse in Hamburg. I don’t know about any other bands, most songs we did were rehearsed in Liverpool or on the road touring in the U.K.
Time for a bit of scandal! Spencer Leigh’s book "Let’s Go Down The Cavern", generally regarded as the bible of Merseybeat, contains a photo of yourself, Johnny Gustafson and Johnny Hutchinson (among others) at the Star Club, with a couple of girls apparently called Big Bettina and Astrid. Do you remember anything about them? BRIAN: Big Bettina was a barmaid at the Star Club (she had a terrible crush on John Lennon) and Astrid was, I think, a barmaid in the pub where the picture was taken. I think it was next door to the Star club downstairs in a cellar. The general standard of the bands on Merseyside in the early sixties seems to have been very high. Which bands did you rate the most, and which of the other groups were you most friendly with? 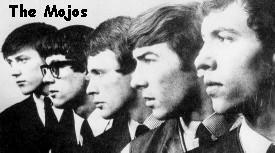 BRIAN: Kingsize Taylor and the Dominoes, The Beatles (of course), Howie Casey and the Seniors, The Roadrunners, Griff Parry Five, Faron's Flamingoes, the Fourmost, Remo Four, and last but never least the Mojos. Do you remember the circumstances which led to Johnny Hutchinson filling in for the Beatles on a couple of occasions after Pete Best had been sacked? BRIAN: We were playing a few gigs with the Beatles (one was in Chester) and Pete Best didn’t show up after being given notice that Ringo was to join them (who can blame him). So they asked Hutch to stand in (He’d played with them before) but he didn’t really want to, because he liked Pete and thought it was a bad deal he was given. I think Epstein persuaded him and he had to play the sets with us and then with them. I’ll tell you another thing about those sets, I thought they sounded different and more aggressive than they ever sounded before. If only....there’s a thought to ponder on. Did you have a good working relationship with Brian Epstein? Some of the anecdotes in "Let’s Go Down The Cavern" suggest that he didn’t relish your rowdiness! There’s even a copy of a letter that he wrote to a club in Bootle, apologising for your behaviour during another band’s performance. BRIAN: Epstein was a good guy, who saw something in the Liverpool scene in the early 60’s that maybe no one else did. He knew that changes would have to be made with certain personnel in the bands he was to manage. He tried to establish dress codes and polite, non threatening behaviour when speaking in public or to the press. We were a rowdy band on, and off stage, so at times these rules were hard to comply with. We had run-ins with Epstein all the time, looking back it was like we self destructed because people in the business were always trying to change us. The Big Three was at it’s best playing 2 o’clock in the morning in sweat drenched clothes, with a case of beer at the side of the stage, and Johnny Gus bellowing out "Good Golly Miss Molly". The thought still sends shivers through me even today! What does you do for a living today? BRIAN: I am semi-retired. I teach music out of my studio at home in Calgary, Alberta, Canada. I have students of all ages, the Styles ranging from classical, blues, rock, & country. 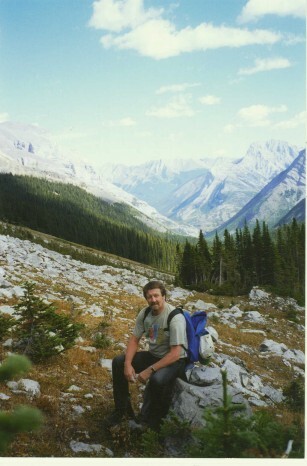 I spend as much time as possible hiking in the Canadian Rockies with my wife Dorothy or visiting our family and grandchildren in California. 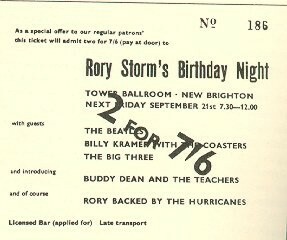 Are you still in contact with other musicians from the Merseybeat scene? BRIAN: I have always kept in touch with Johnny Gustafson over the years, and more recently with Nicky Crouch from the Mojos. Through the Merseycats organization I have been in contact with a number of other musicians such as Howie Casey, Paul Pilnick, Paddy Chambers etc. Did you hear the sad news that Brian O'Hara (vocalist of The Fourmost) had committed suicide, and Colin Manley (guitarist of the Remo Four) had died of cancer? BRIAN: As well as the others you have mentioned, the most recent passing was Johnny Guitar from Rory Storm and the Hurricanes. It is very sad to hear of such things but it makes me think of something John Lennon once said to me. I remember him saying "wouldn't it be great to make a record" the rest is history as they say, and I think that we were all so fortunate to be a part of it. Lastly, have you come across any contemporary groups who try to re-evoke the Merseybeat sound? There’s a great band from Edinburgh called the Kaisers (as in "Kaiserkeller"!) who have already released 4 LPs, and go all out to reproduce the sound/look of the time, complete with Vox/Selmer amps, three-buttoned suits and covers of "Let’s Stomp", "Some Other Guy" and even your own "You’ve Got To Keep Her Under Hand"! There’s also a Japanese band (?) called the Neatbeats who are every bit as authentic. BRIAN: No, I have lived in Canada for 25 years now and I don’t really know much about the bands in Britain or anywhere else that are playing stuff from the 60’s. 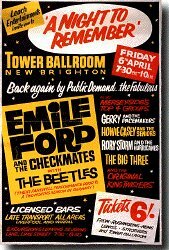 I do however, keep up with the original members of bands who have re-formed to play around the Liverpool area. Now if the Star club re-opened and they wanted a band to play the 2 a.m. slot for a few weeks, who knows!